View cart “400w Digital Ballast Complete Combo” has been added to your cart. The new Gavita Pro line e-series complete fixtures are next generation professional grow light solutions. Using high-output, high frequency lamps, the Gavita Pro 1000 e-series and Pro 750 e-series ballasts are now capable of being remote controlled by the Gavita Master Controller. Comes with an 8 foot 240v power cord. Suitable for high frequency 400V electronic horticultural lamps. The SolisTek A1+ DE (Double Ended) 1000 watt fixture is a professional high output light with the highest performance on the market based on reliability, output, & consistency. Safety and technology are the foundation of all SolisTek products. This SolisTek commercial lighting fixture is equipped with many features that are SolisTek exclusive and designed in a way that is simple & easy to use. The SolisTek A1+ powers both double ended HPS & Metal Halide lamps. SolisTek DE HPS lamps have proven to have incredibly high PAR output, a broader spectrum than traditional single ended HPS lamps, and only 5% depreciation @ 10,000 hours. SolisTek Metal Halide lamps have proven to be a great solution for providing mized spectrum to your garden. 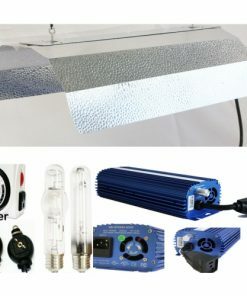 Electronic Ballast with fan : Operates both Metal Halide and High Pressure Sodium Bulbs, Runs 150w, 250w, 400w bulbs, Dimmable, Runs 15% cooler than other digital ballasts on the market, Power Efficiency of 99.9%, Higher lumen output than magnetic ballasts, 400w with Fan. Electronic Ballast with fan : Operates both Metal Halide and High Pressure Sodium Bulbs, Runs 250w, 400w, 600w bulbs at standard operation, Runs 15% cooler than other digital ballasts on the market, Power Effeciency of 99.9%, Higher lumen output than magnetic ballasts, 600w with Fan. Electronic Ballast with fan : Operates both Metal Halide and High Pressure Sodium Bulbs, Runs 600w, 750w, 1000w bulbs at standard operation, Runs 15% cooler than other digital ballasts on the market, Power Effeciency of 99.9%, Higher lumen output than magnetic ballasts, 1000w with Fan. 1 x 400 watt dimmible digital ballast (250-400- super lumens).